After a sleep of more than 25 years, I resumedmy passion of then 5 years. Ah enfin un autre frenchy. We love picts of collection on TB. That paint scheme reminds me of what I did to my Grasshopper a long time ago - a Dutch flag (or French from a different angle). Welcome Pascal, look forward to seeing what else you have there. 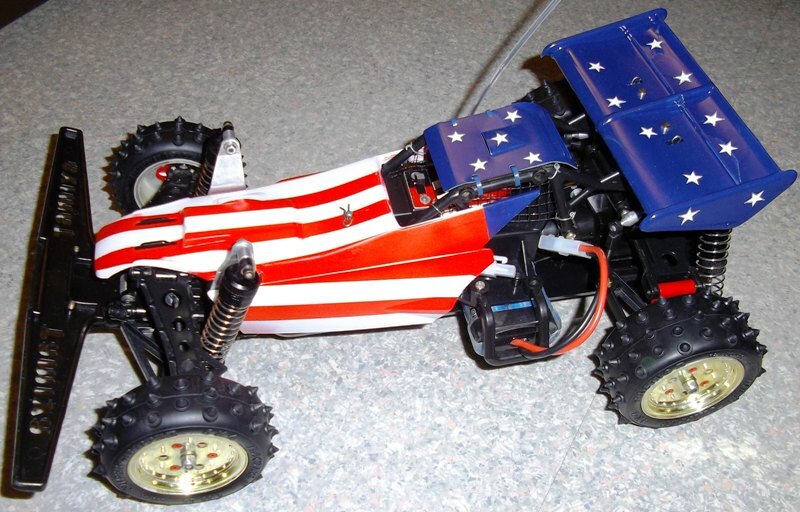 If I didn't know any better I'd have to say that particular Supershot buggy is a closet American in the making. I enjoy restoring old Tamiya off-roaders myself but like to keep them box art as IMHO it increases their value & makes them much easier to sell. rcmadkiwi wrote: Welcome Pascal, look forward to seeing what else you have there. If I didn't know any better I'd have to say that particular Supershot buggy is a closet American in the making. I enjoy restoring old Tamiya off-roaders myself but like to keep them box art as IMHO it increases their value & makes them much easier to sell. I bought Supershot in 1987 and in the time I'd decorated it as on the photo. Since 2013 I renovated Tamiya (Boomerang, Supershot, Hornet,...) but also Kyosho (Optimas, Ultimas Lazer,...). I reconstructs chassis "box art" but for painting and decorations I add my personal touch. I hear it's highly addictive with no cure known to man & kills off shelf space rapidly. I wish I'd been able to keep more of the restorations I've done but the sales helped pay for my own hobby & it's only been recently that I keep them for my shelf. There's a Hotshot 2 that I really wish was still on my shelf & really regret selling so never again. Bonne année Pascal. See you soon my friend.